The Spanish-born German actor Daniel Brühl is the star of The Alienist, the new period drama based on the homonymous book by Caleb Carr. Brühl, who is best known for Good Bye Lenin!, Inglourious Basterds, Rush, Captain America: Civil War and The Cloverfield Paradox, plays Laszlo Kreizler, a doctor focused on patients with mental health problems; in other words, a psychologist, though back in the late 19th century - as we learn since the beginning of the show - these experts were known as alienists. While in the first three episodes we get to see Brühl’s character working as an alienist - which sometimes means just telling a mother that her daughter isn’t sick but rather just entering adolescence - he quickly takes the role of a detective, once he learns that the brutal murder of a young boy has similar characteristics to the fatal case of one of his former patients. 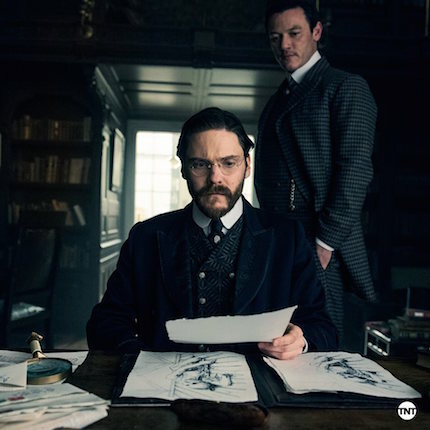 Set in New York City in 1896, The Alienist has a Sherlock Holmes vibe when Dr. Laszlo starts following the traces of a serial killer with the help of illustrator John Moore (Luke Evans), secretary at the police department Sara Howard (Dakota Fanning), real detectives Marcus and Lucius Isaacson (Douglas Smith and Matthew Shear), and the police commissioner himself, Theodore Roosevelt (Brian Geraghty), who supports Laszlo’s investigation unofficially. As the team gradually starts connecting dots, via the early incarnations of such procedures as fingerprint identification, The Alienist goes to really dark places, exploring issues like child prostitution, police corruption, and Laszlo’s own attempt - a la Manhunter/Hannibal - to understand the mind of the murderer. The series premiered on TNT in late January and its first season is scheduled to conclude on March 26, before going to Netflix on April 19. I spoke with Daniel Brühl to learn more about Dr. Laszlo, early psychology and The Alienist. 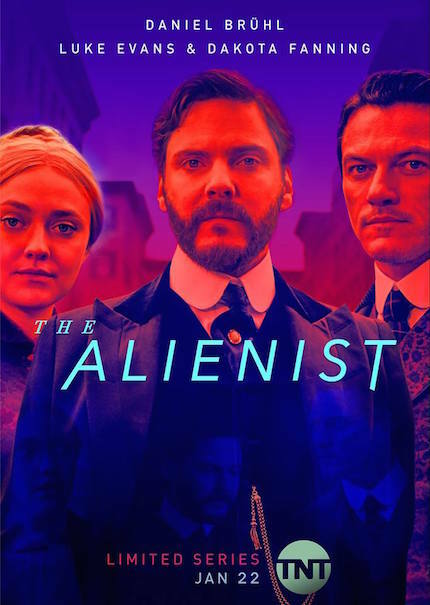 ScreenAnarchy: THE ALIENIST is a mix of different elements. How would you describe it to someone who is not familiar with the book? Daniel Brühl: Yeah, it’s a combination of things. On the one hand, obviously a psychological thriller, a dark crime story, but it’s also a book that deals with New York at the time, so you’ll learn a lot about things that happened in New York historically. Then it also deals with the beginnings of many sciences, like psychology and forensics. Even if Laszlo is a psychologist, he takes the role of a detective and the show has a SHERLOCK HOLMES vibe, so I’m wondering if you were inspired by the so-called detective fiction? Yeah, that’s something that attracted me. The character that I portray is, you said it quite rightly, a sort of a detective, he’s like a profiler, and not just a doctor and psychologist. That’s something that appealed to me because I grew up reading stuff like Sherlock Holmes, but also I was attracted by dark stories and writers like Edgar Allan Poe. I enjoyed very much reading Jekyll and Hyde when I was young, reading about Jack the Ripper… it’s the whole gloomy, dark, sinister world that totally attracted me. The show predates many modern detective stories, showing the beginnings of methods like fingerprinting and so forth. In that sense of a period piece, how was the research process in order to play your character? The first thing I did is reading about the important, famous psychologists of the time, just to get an understanding of the way they worked and thought. It’s fascinating because they were really pioneers and many of them not very well respected at first because the science was so new; psychology was form in 1870, before that it was considered to be a branch of philosophy, only in the 1870s it started to be seen as a proper science. My big luck is that I married to a psychologist, so my wife supported me from the beginning to the end; she put me in touch with psychologists and she also helped me reading the script and to point out the historical differences, to say how it is nowadays and back in the day, how things have developed and changed. But I also wanted to know more about New York at the time, to understand better where all those people came from, the rich ones, the poor ones, the politics, the corruption… I mean, I as a German didn’t know that Roosevelt was running the police department before he became president. It was a whole experience and also like a history lesson for me. I watched the first three episodes and through Laszlo we also have a RED DRAGON/MANHUNTER vibe as he tries to put himself in the mind of the serial killer. It seems like it’s going to get a bit dangerous, so what can you tell us about this aspect of the show? Exactly, this guy is interested in the human being behind those vicious murders. He knows that he has to go into very dark places in order to understand that man and ultimately find him. We will also find out that we are dealing with an equally intelligent individual as a killer, so it’s almost like two guys up nearing each other. The further Kreizler goes into the deeps, the easier it’ll be for him to find the killer, but that means that yes, there will be a lot of danger. There’s also a hint of Laszlo’s personal life, in particular his strange relationship with his servants. How fascinating was this aspect? Yeah, it’s very interesting and endearing to read about Laszlo in the book. He’s a man who has really a genuine interest in human beings, he’s a humanistic guy. In his life he has been able to help some people out that would’ve ended up in prison or in the gallows and would’ve been executed, just because in court he could prove that they were innocents and acting under the influence of their various mental disorders. These are the people he also lives with; he’s with Cyrus (The Wire’s Robert Wisdom), Mary (Q’orianka Kilcher) and Stevie (Matt Lintz), and these are all people who would’ve ended up in a rotten cell if it wasn’t for him, so there’s that weird relationship that he has with them. They are servants and work for him, so there’s that distance but we’ll also find out that there’s a sicker bond and more interest and curiosity in these people throughout the show. On the rough reality of child prostitution, how challenging was to work with a subject like this one? This is one of the core subject matters in the show, and it couldn’t be more horrible. Seen that this is still an issue, and has been an issue in the history of humanity, I think it’s important to deal with that subject matter, no matter how painful and horrible it is. To understand it, to think that this traces to New York and that there were coverups, politicians and corrupt policemen who didn’t do anything against it and were helping criminals out, is another shocking history lesson for me about how creepy New York was. Again, this is still going on today; when we were doing the show we were surprised of how current and relevant many of these subject matters are. What Dakota’s character is facing everyday in the police department, is just pure sexual harassment. Gender issues, class issues, immigration crisis… so many things have actually not changed that much. We are making a show about 1896 and not that much has changed in these regards.